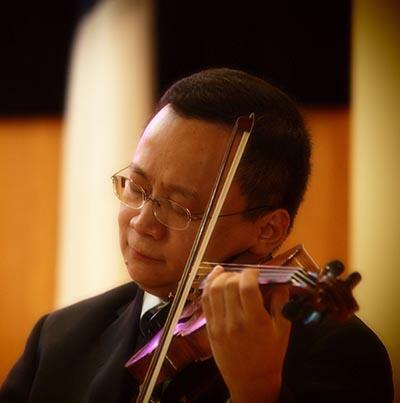 The musical guest for our service on Sunday, February 3rd will be Lan Qiu, violinist with the Phoenix Symphony. Lan will join with Larry for a varied program including Ravel’s beautiful “Pavane pour une infante défunte”, and an exciting New Year’s piece from Lan’s native China to help ring in The Year of the Boar, which begins on February 5th. Invite your friends to join us to hear this amazing guest soloist! Lan has been playing in the first violin section with the Phoenix Symphony since 2003. Between 1996 and 2000, Qiu was a member of the first violin section of the China National Symphony Orchestra, one of the most outstanding professional orchestra in China. He toured and performed in most countries in Europe, Asia and North America between1987 and 2000. Since his graduation in 1989 from Central Conservatory of Music in Beijing, China, Qiu was serving acting concertmaster for the China Central Philharmonic Orchestra (former China National Symphony Orchestra) in Beijing till 1996. With great honor, Qiu was invited to perform at the First Shanghai Worldwide Chinese Artist 2006 New Year’s Concert in China. In 1996, he was elected as the “Outstanding Young Artist of China.” Qiu was also the winner of the National Youth Violinist Competition in 1990. In February 2009, Qiu was invited to be the guest concertmaster for the Chandler Symphony Orchestra. With the same orchestra, Qiu was featured as the violin soloist performing Sinfonia Concertante in Eb Major by W. A. Mozart with violist Dwight Lear in March this year.